For those of you just starting up mixing drinks, here's a suggestions of few bottles you need to have. These will get you started at a reasonable price. From there, any additional bottle will get you a few more possible drinks! Absolut Vodka. 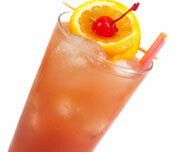 Vodka mixes very well with just about anything, you'll find a lot of drinks made with vodka and juices for example. Since you'll be mixing it, you don't need to go for the priciest bottle. Don't go with cheap vodka either: on top of giving you a headache, cheaper vodka leaves you with a burning feeling and a bad taste. White rum. Just like vodka, white rum mixes very well and is used in a lot of drinks. Havana Club and Bacardi are popular choices. Tequila. This spirit doesn't mix that well except for a few exceptions: it does magic with lime juice and orange liqueur in the Margarita recipe for example. If you're short on budget, keep this bottle for your next run as good quality tequilas are quite expensive. Even for mixed drinks, don't go with the cheaper brands. Go at least with Sauza Silver or Jose Cuervo Clasico Silver, they are a bit rough for shots but great for mixing. Triple Sec. This orange liqueur is not expensive and is used in a lot of tropical drinks. You can use it as a replacement to Cointreau, Grand Marnier and Curacao. Mixers. Coke, Sprite, 7UP, Canada Dry, etc. Juices. Cranberry, orange, fresh lime and lemon juices. Easy to make as the title, Splendid, simple drink. A very great relaxing dinner beverage for non-alcoholic drinkers. 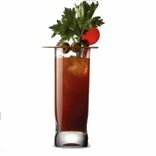 A variant of the Bloody Mary ordered at the Ceasar's Palace in Las Vegas by crooner Tony Bennett. The perfect wakeup drink to enjoy the sunrise at the Outerbanks in North Carolina. Fresh orange juice with just the right amount of vodka and sweetness provided by Patron Citronge Orange Liqueur then topped with a maraschino cherry. Saltiness, sweetness and sharpness all at once. A sweetened version of one of the most classic cocktails. The official Cuban drink. Excellent and refreshing! One of the simplest cocktails you can do using white rum. Cuban Rum (ex: Havana Club) really turns an average cocktails into a great one! The famous shooter, as a cocktail, that uses lemon instead of lime. Clean and brisk. Refreshing and made with style. Perfect for pregnant women on a party.